Standard soft pile can be cleaned using soap and water. Use on whiteboards, porcelain and other non-porous surfaces. 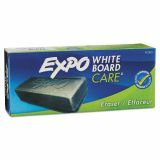 EXPO Dry Erase Eraser, Soft Pile, 5 1/8w x 1 1/4h - Sanford Expo Marker Board Eraser removes marks easily from dry-erase surfaces. Markings are removed quickly due to the eraser's soft pile. 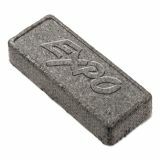 Eraser will work on any sort of whiteboard- porcelain, melamine or other Expo surfaces. Rinses with soap and water.